Whilst busy planning for an upcoming trip that will include a safari in South Africa, my thoughts inevitably turned to which pair of binoculars that I was going to take with me. In this regard, I guess that I am in the fortunate position of being able to pick and choose based on a number of instruments that I am currently testing and writing reviews for and added to that, my experiences with others I have reviewed in the past. However, my thought process and the ultimate decision that I make is really not that much different than if I was browsing the internet deciding which instrument is best for my particular needs. For an in-depth look on how I put together my shortlist, take a look at my articles on choosing the best binoculars for safaris & travel and how to choose between binoculars, but suffice it to say, I narrowed my selection down to mid-sized binoculars with a 10x magnification. Then taking from my prior and generally very posetive experiences with the Snypex Knight D-ED range, firstly the 8x42 and then the 8x32 models, I was fairly certain that not only would the build quality and the view thought the 10x32 model be equally as good, but looking at their specifications, this model offered pretty much what I was after. As I have already written an in-depth review of the 8x32 version, to save repeating myself, in this review I will mainly be focusing on the differences between the models and the particular aspects of this model that are unique, its strengths, weaknesses and anything else which sets it apart from the other models in the series. Before I dive into the 10x32 Snypex Knight D-ED review, I thought it would be of use to quickly expand on the series as a whole, especially as I will be referring to the other models quite frequently on this page. Initially, when Snypex Optics first started, they released their Knight ED series, which at the time was their flagship range. I reviewed a number of these models including the outstanding Knight ED 8x42 and the 10x32 Knight ED, which went on to win the award for the Best Safari & Travel Binocular in 2014. 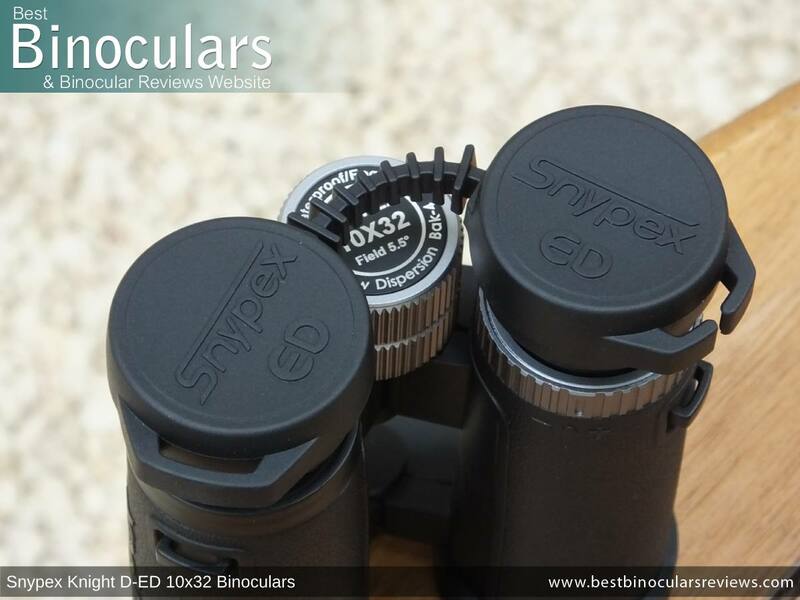 Then after further research and by listening carefully to the feedback that they received back from their customers and from the optics industry (including my comments here on BBR), Snypex decided to improve on this series and thus the Knight D-ED was born. 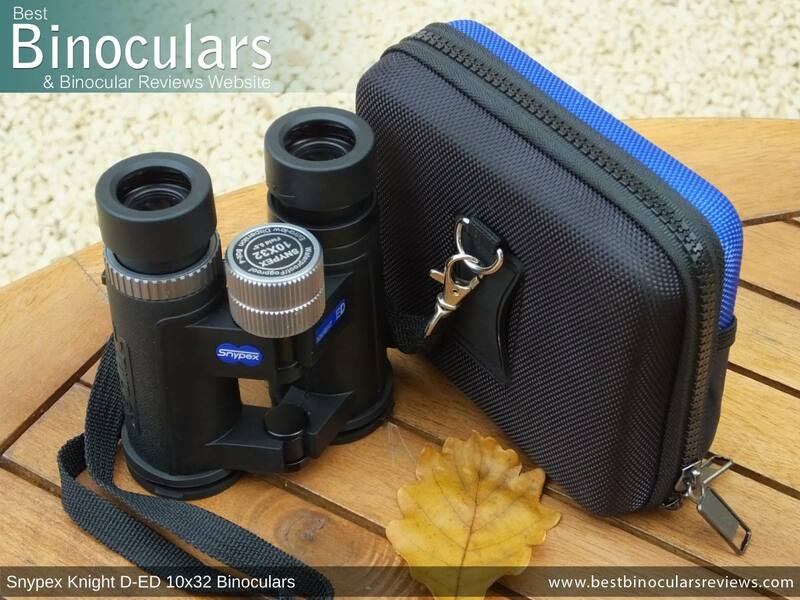 As is normally the case with binoculars from the same series and size, but with different magnifications, the chassis and all the external components used on the 10x32 model are exactly the same as that on the 8x32 version. So rather than repeating myself, I have listed the main points below. For a more detailed review of each of these, take a look at the Body section on the Knight D-ED 8x32 Review. 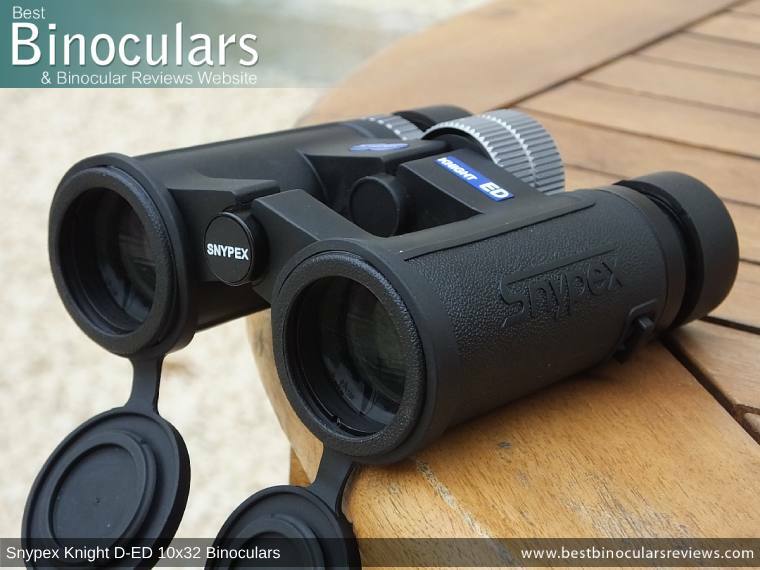 The body on these Snypex 10x32 D-ED binoculars is fully sealed and they are described by the manufacturer as being both waterproof and fogproof. Whilst I did not test this, Snypex Optics state that they are waterproof to a depth of 1 meter for 15 minutes. They also state that they have an IP77 Rating, which does confuse me a little. This is because the first digit is for solids and usually only goes to 6, where this means the device is completely "Dust Tight". The second digit is for liquids and an IP rating of 7 means that they will remain watertight up to a depth of 1 meter. For fog proofing, Snypex has used Nitrogen gas to fills the interior cavity with. This moistureless gas prevents the internal glass surfaces from fogging up when the optics go through quick temperature fluctuations, like when you take them outdoors on a cold winters morning. By opening and closing the central hinge, you can adjust the distance inbetween the eyecups to match that of the distance between your eyes. 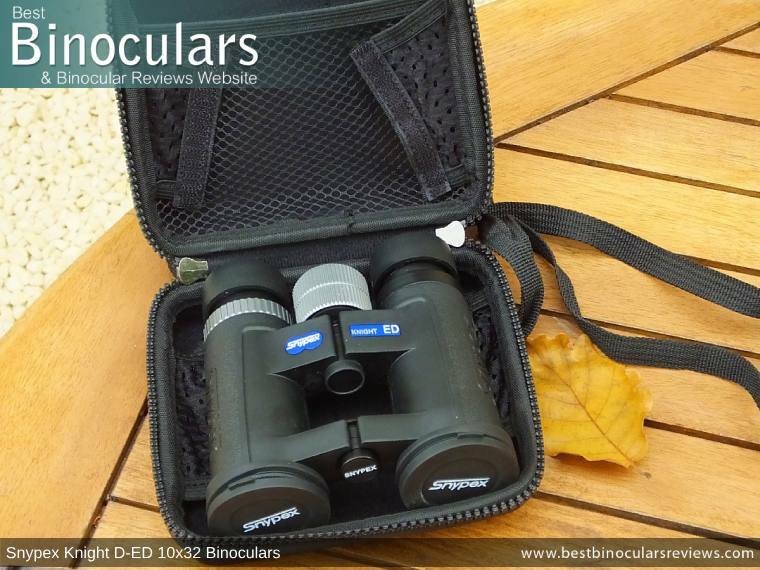 This Inter-Pupillary Distance (IPD) on these Snypex Knight D-ED 10x32 binoculars is good for a mid-size instrument as goes from a minimum of 5.5cm, right upto 7.4cm with the hinges fully open. One of the most obvious improvements and differences between the "standard" Knight ED's and the higher specification Snypex Knight D-ED binoculars is the use of an aluminum focus wheel and not a plastic one. As well as adding to the aesthetics, the machined corrugations on the outer surface add to the grip levels, which along with the large size of the wheel really helps when using these binoculars whilst wearing thick winter gloves. The wheel itself turned very smoothly on my sample and just like the 8x32 version, there was no free play at all along the entire focal range, which is not always the case and for me is a definite indicator of quality. The gearing is the same as on both 32mm binoculars in that it takes about 1� revolutions of the wheel to go from the infinity to the minimum close focus distance. In my experience, I would describe this as an average to fairly aggressive gear ratio and thus offers a nice compromise between the speed at which you can make large focal changes and the ease at which you can make very fine adjustments. 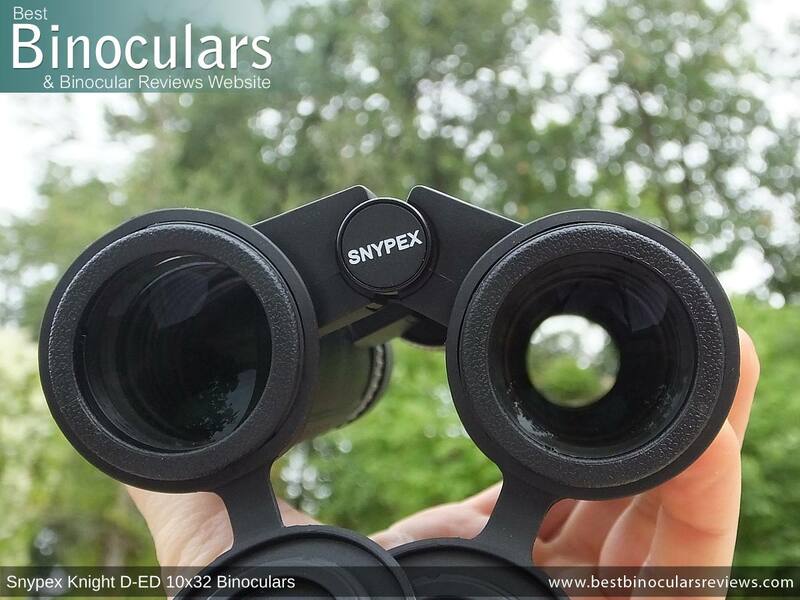 These Snypex binoculars have an aluminum ring located on the right eyepiece that is used to calibrate the binoculars to your particular vision. Although it is not lockable, it is far superior to the common plasic ones and I really like the fine ratchet on the turning mechanism. As I said on my 8x32 Knight D-ED review, this is a minor detail, but it once again shows an impressive attention to the small details, which I feel all add up and which separates the great from the good. Both the instruments weight and the dimensions of the 10x and 8x 32mm Snypex Knight D-ED binoculars are exactly the same the same. As with the 8x32 model, the 32mm objective lenses on these 10x32 Snypex knight D-ED binoculars are made up of 4 Groups, with 5 Elements. 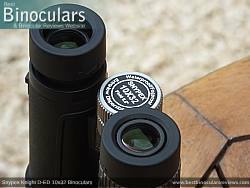 Added to this, atleast one of the elements within the objective lenses is made from extra low dispersion (ED) glass. The exterior lens on the eye-piece is made up of 3 Groups, with 5 lens elements. However measuring 17mm diameter, the exterior ocular lens is not what I would class as huge. This is not a major deal, but smaller ocular lenses can in theory make it more difficulat to line them up with your eyes. However, i never really experience any problems with this during testing. 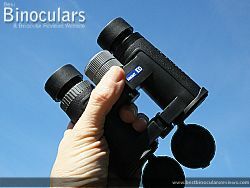 For more information: Ocular Lens Size in Binoculars. The Snypex Knight D-ED 10x32 binoculars have Roof (Dach) prisms made from BaK-4 glass which is what i would expect at this high level. Knight ED's like many roof prism instruments in that price bracket use very highly reflective Silver coatings on the prism. This is good and certainly improves upon the aluminium coatings found on some binoculars as it increases the reflectivity of this surface to between 95% and 98%. However, the very best binoculars, like those in the Knight D-ED series have dielectric mirror coatings added to the prisms that boost the reflectivity to 99% and they do it across the full light spectrum which is important. This process is expensive, but it results in an image that has a far more accurate color reproduction as well as improved image brightness because more light (from all the spectrum) gets reflected through the prism and on towards your eyes. As we would expect at this level the optics on these are fully multi-coated, which tells us that every outer surface throughout the entire optical pathway has multiple layers of an Anti-reflection material added to them. This makes a big difference to both the image brightness and quality when compared to lesser instruments that are only "multi-coated" or "fully-coated". Phase correction coatings are also added to the prisms. For the highest possible definition, this is essential as it corrects something known as phase shift that occurs to each of the wavelengths as it passes through a roof prism. Snypex Optics then add a water repellent material to the exterior lens surfaces. The properties of this make water form into beads and thus easily roll off the glass (as is demonstrated by the equivalent Zeiss LotuTech coatings on the right). Coatings like this are only found on the highest specification instruments and they make it easier to continue using them in wet conditions. These coatings also prevent water stains and make it less likely that you will leave oily fingerprints on the glass. Thus you don't have to clean your lenses as often and when you do, less pressure needs to be used, which certainly reduces the chances of you scratching or permanently marking them. 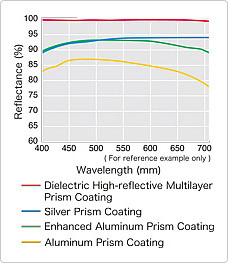 To put this extremely high level of optics and coatings into perspective, take a look at the comparison table below. At a distance of 1000yds, these 10x binoculars offer you a view that is 288ft wide (96m wide at 1000m), or to put it another way, they have an angle of view of 5.5°. To put this into perspective, take a look at the table below. This clearly shows FOV is a little narrower than what you would expect from an 8x instrument and sits around mid-table when compared to mid-sized bins with 9x or 10x magnifications. So not brilliant, but at the same time not at all bad. Note: If a wide FOV is a really important aspect for you, my general advice is to opt for a lower magnification. For example, the 8x32 Knight D-ED produces a view that is 351ft wide at 1000 yards away. 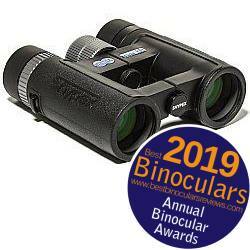 As with all the mid-sized Snypex Knight ED binoculars, these posses an extremely good minimum close focusing distance of only 3.9ft, which as you can see from the table above ranks them amongst the very best. 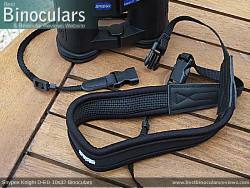 This quality means that these binoculars make an excellent choice if you also like to observe things from very close range. 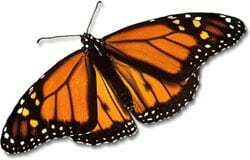 This will of course include butterflies, other insects, flowers. However, I would suggest that for viewing things at very close range that move about very quickly (like birds), you may be better off with the 8x version as they have a wider field of view, which will make it easier to track them. The excellent quality twist-up eyecups in combination with a full 17.5mm of mm of eye-relief is great news, especially for eyeglass wearers as you should easily be able to adjust them to allow for the extra space take up by your glasses and still get your eyes to the right distance behind the ocular lenses in order to achieve the full image. 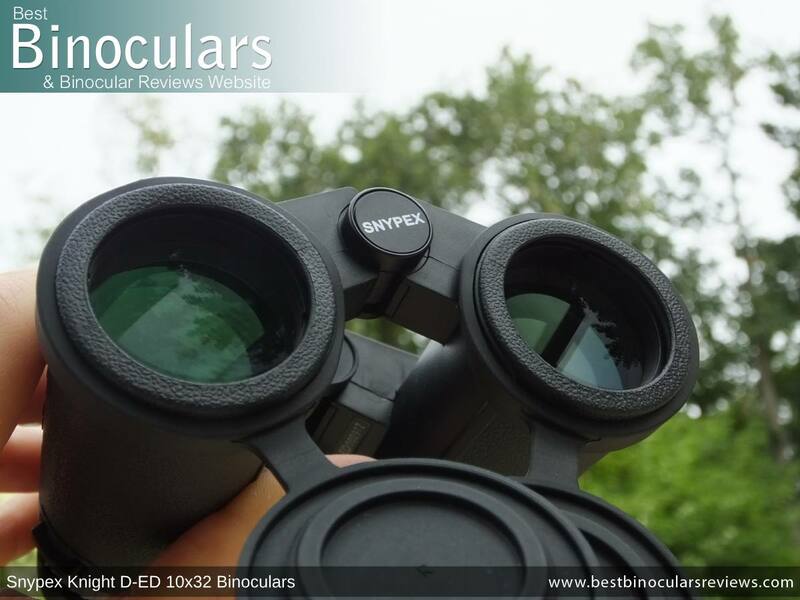 Note: TheseSnypex Knight D-ED 10x32 binoculars make it onto the BBR list of long eye-relief binoculars and what is also interesting is that whilst these have the same level of eye-relief as the standard 10x32 Snypex Knight ED, they both actually have more than which you get on the 8x32 version, which may be something to keep in mind should need to wear any sort of eyewear whilst binning. With only a 3.2mm exit pupil, these and indeed all 10x32 bios are not really designed for use in extreme low light conditions. Where these excell is in wide open areas where the distances to your subjects are a little longer and where the light conditions are generally better. 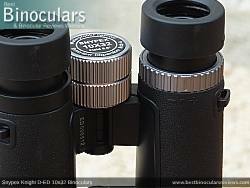 However, due to the very high level optics and coatings, including things like Dielectric mirror coatings, I thought that these deivered a bright image in good light conditions and comparing them to my benchmark 10x32 binoculars, I can comfortably say that they will outperform most normal level 10x32's when the light begins to fade or if you find yourself in a thickly wooded area. I was really impressd with the general quality and color reproduction of the view that you are presented with when looking through these Snypex 10x32 Kinght D-ED binoculars. I thought that the colors look very natural and true to life and there is certainly no apparent and unwanted tinting that I sometimes observe, especially on cheaper compact instruments. I also thought that even on very bright, sunny days that the level of contrast through these is good. To my eyes, there is enough contrast so that you get a good feeling of depth, but at the same time it is not so harsh so that it makes the image appear unnatural. Indeed this is the same for the colors, they are vivid, but not too much so as to look artificial or slightly cartoon like, which is sometimes the case. In general I find it easier to notice color fringing on higher powered instruments, so I was half expecting to see a little more through these than the 8x32 version. However to my eyes the color fringing that I could see was about the same in both instruments and the level was extremely minimal even when pushing it to the extreme by looking along the edges of a dark telephone line infront of a bright sky. 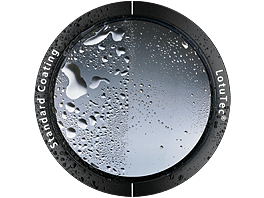 It is here in particular where the APO lens design with ED glass elements most certainly makes a difference by reducing chromatic aberrations that are the main cause of color fringing. 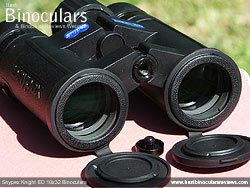 During my testing and general use of these Snypex binoculars, I never became aware of any type of image distortions. This includes cases where the image seem to cure inwards or outwards, or look wavy. The view also remains completely sharp, right to the periphery. In this area, they are as good as any that I have ever seen. 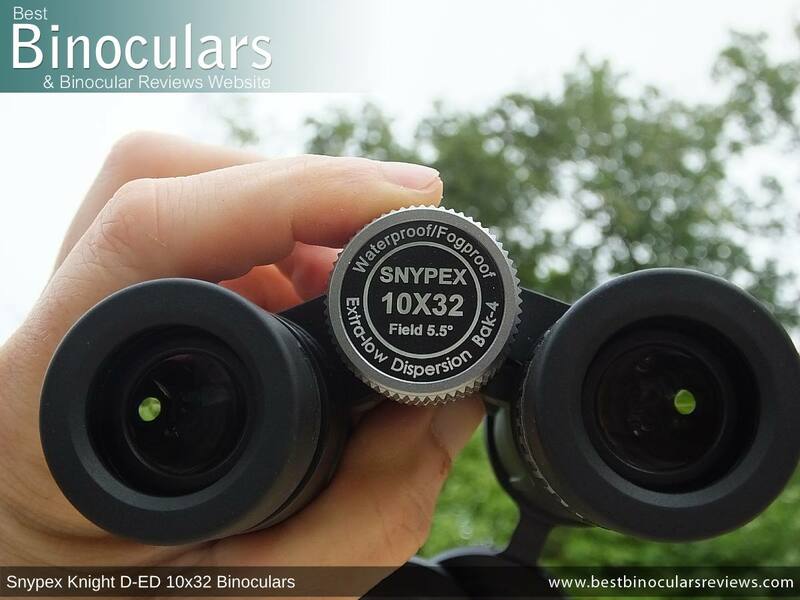 Mostly as a result of the smaller exit pupil, these 10x32 Snypex Knight D-ED binoculars don't quite match the 8x32 version when it comes to the low light performance. But apart from that, I would describe the view through them as Outstanding and far superior to that of your average mid-size/32mm binocular. In general, the included accessories that come bundled with these Snypex Knight 10x32 D-ED binoculars are excellent and up there with the very best. 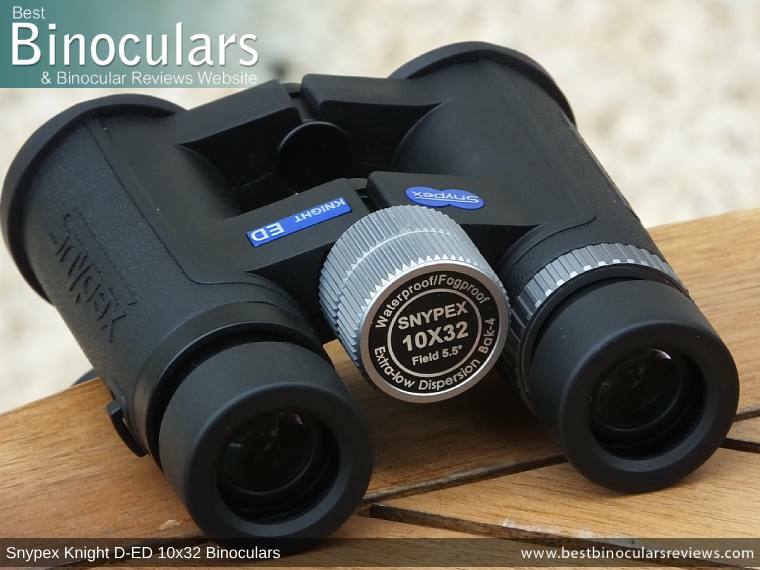 They are also the same as used on the models within this series that I have already reviewed, which you can read about in detail and watch the video here: Accessories on the Snypex Knight D-ED 8x42 Binoculars. Overall the case is one of the best and of a far better standard than the majority that comes included with a pair of optics. The branded Snypex neck strap is excellent and is especially impressive when compared to what you usually get with smaller binoculars. So whilst this is a small thing, it is another indication to the great attention to detail that Snypex Optics have put into this product. Once again the quality is excellent and better than most others out there. 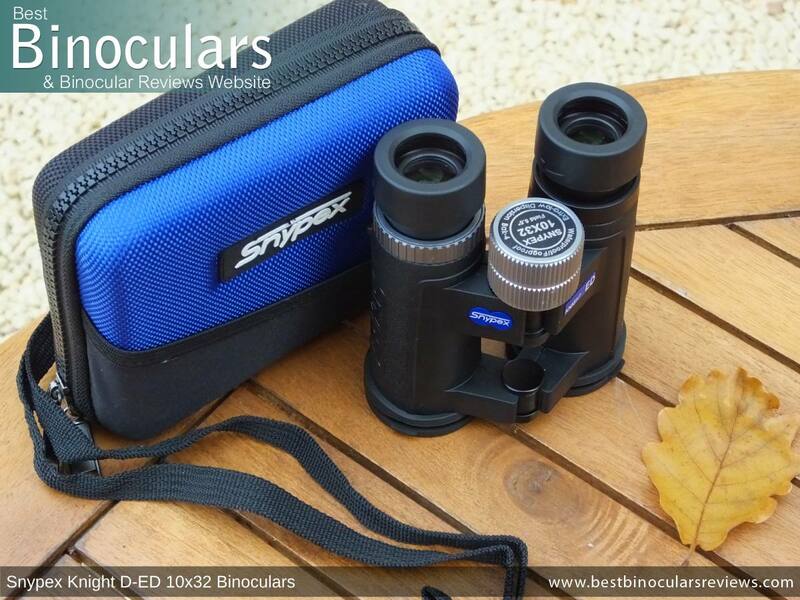 These Snypex Knight D-ED 10x32 binoculars are supplied with a good quality cleaning cloth and is more than adequite for cleaning the body and occasionally light use on the lenses. I would still recommend making the small investment in a lens cleaning kit to ensure that you don't mark the lenses when thoroughly cleaning them. The table below displays a small selection of 10x32 binoculars in the BBR database. Like the 8x32 version, this Snypex Knight D-ED 10x32 is truly an excellent mid-sized binocular and they really do compare very well when pitted against any of the European "alpha" level equivalents, but are in most cases far less expensive. 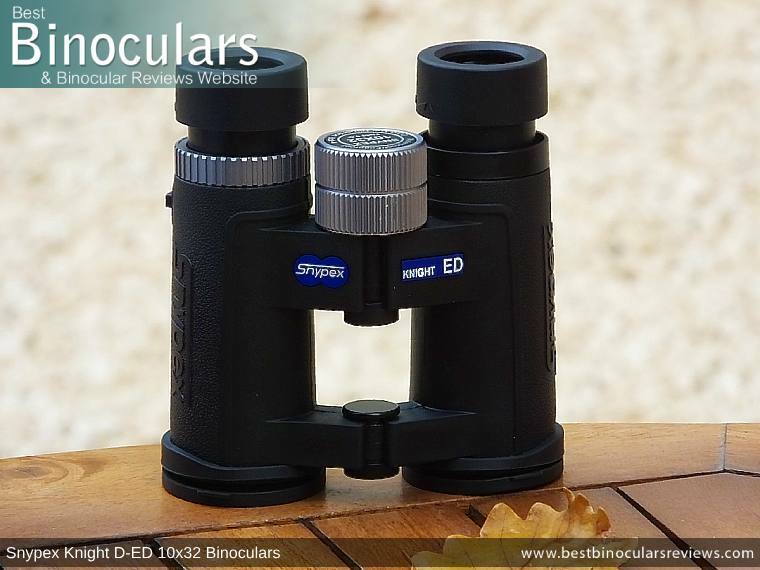 Build quality and the materials are superb and I really do like the good attention to detail, for example, the aluminum focus wheel, ratchet diopter adjuster and excellent quality carry case. The level of optical components and the coatings used is up there with the very best and which most certainly plays a major role in the superior image quality that these deliver. 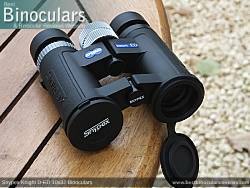 In this regard, they are up there with the best 10x32mm binoculars that I have tested. 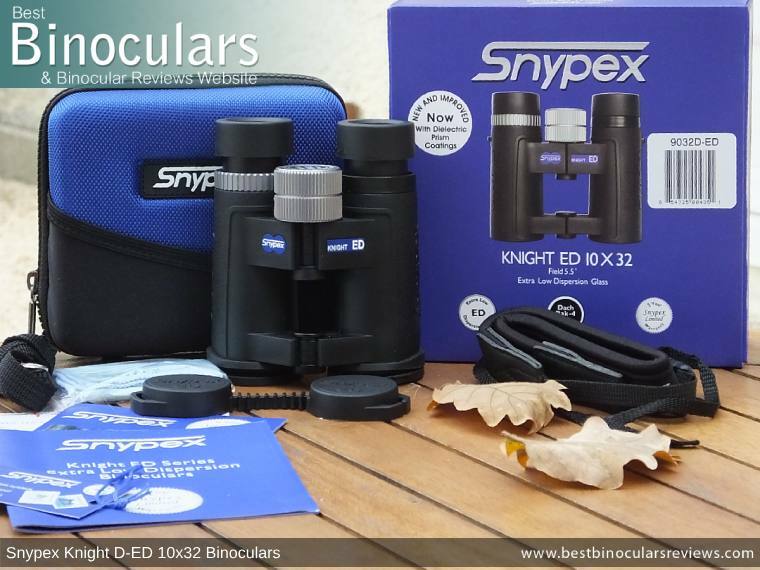 These Snypex binoculars are both lightweight and compact, even when compared to other 32mm instruments, which is something that I really do feel is worth emphasizing, especially if you are buying these for a travel or because you want a more lightweight, easy to carry instrument. The minimum focus distance is outstanding. For some, the polycarbonate chassis (even if it is reinforced with fiberglass) could be seen as a weakness, especially if outright strength is what you are after. In this case, a magnesium one would be preferred. However this would add weight to the instrument and for almost all normal uses, this chassis is more than strong enough. Whilst not bad, I would say that the field of view is a slight weakness in these. Although I would suggest that if you really do require a wide view, then it would be better to opt for the 8x32 option instead. I started this review by wondering if these Snypex Knight D-ED 10x32 binoculars would live up to the extremely high standards of the other models in this series and if they would indeed accompany me on my safari holiday. The answer to both these is most certainly yes and I have no hesitation whatsoever in firstly taking these on my travels and in highly recommending them as a great high-end option for uses like safaris, travel, camping and hiking. 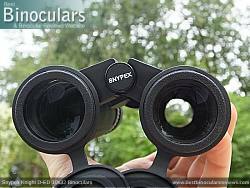 These Snypex Knight D-ED binoculars are also ideal for most general nature and wildlife observation scenarios whenever you want a high performing, but small, lightweight binocular. Here I am thinking of people like hunters or photographers who also carry other equipment.